Shhhhhh! Dr. Harvey Karp, author of the best-selling book Happiest Baby on the Block, strongly recommends using a white noise machine to help your baby self-soothe, fall asleep faster, and sleep longer. We totally agree! The best baby sound machines are safe, reliable, have adjustable volume and varied noise types, can work with batteries or a wall plug, and are equipped with an auto-off timer. We pulled together 15 different sound machines and put them to the test with 4 different sets of parents and 5 different babies. Here is a comparison table of the top 5 baby sound machines, followed by our full reviews. Sound machines for baby can be a real life-saver, and make the difference between a decent sleeper and a baby who sleeps so well you'll become the envy of all your friends! In fact, a published study examined how quickly 40 newborn babies fell asleep with or without white noise - 80% of babies using a white noise machine fell asleep within 5 minutes, while only 25% of babies without a sound machine fell asleep within the same time frame. So that's pretty convincing evidence for the effectiveness of a white noise machine to help baby fall asleep! It's also worth pointing out that several of the best baby monitors on the market include the option to play white noise and lullabies, so definitely check those out if you're looking to save some cash and get two features in one system. Here are the Best Baby Sound Machines of 2019! 1. Hatch Baby Rest Sound Machine and Night Light. This is a truly impressive multi-functional baby sound machine that has some amazing capabilities. First, it serves as a white noise machine with adjustable volume and several sound options, including white noise itself but also a forest sound (like crickets chirping), birds, waves, water trickling in a stream, rain, laundry (! ), and a few melodies. We want to point out that many baby sound machines on the market call themselves a "white noise" machine on Amazon and other website, but they actually don't have white noise at all - and it's important to note that white noise is what the research shows to be helpful for helping a baby fall asleep and stay asleep. That's not to say that your baby won't appreciate the other sounds and find them soothing, just that the research tends to examine the effectiveness of white noise rather than the effectiveness of the other sounds. Second, the Hatch Baby Rest also serves as a night-light and sleep trainer. The night light can be white or basically any color of the rainbow, and it has adjustable brightness. The sleep trainer aspect is a time-to-wake indicator for your toddler, which can be set to change night light colors in the morning after a certain time. We found this feature, especially with its preset colors and brightness, to be a life-saver in the mornings. 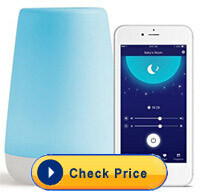 Third, in addition to a noise machine, night light, and time-to-wake sleep trainer, it has a ton of other cool features. It connects to your smart phone via an iPhone or Android app so you can remotely operate it from the comfort of your bedroom or living room. You can choose to operate it manually using the buttons on the bottom of the unit, or manually from the smart phone app. But you can also choose from several presets that were designed by sleep experts - you set the fall asleep and wake up times, and let the system do the work for you! 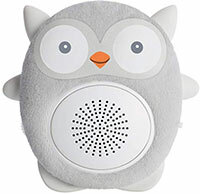 Additionally, while some baby noise machines turn everything on or off at once, this system allows you to turn the night light and sound on or off independently of each other - so you can have just the night light on, just the sound on, or light and sound on at the same time. The newest version of their app has a "toddler lock" which helps keep your kiddo from pushing the buttons and changing the settings, which was a nice touch. The system plugs right into the wall so you don't need to worry about swapping out dead batteries every month, though of course that does limit portability and reliability in a power outage (there's no battery backup). So overall we were really impressed by this Hatch Baby Rest Night Light and Sound Machine system and think it's definitely one of the best baby sound machines on the market, and we truly think it could be valuable to help your baby fall asleep. It also makes a nice piece of nursery decor, definitely a better-looking option than several others on this list. If you want to make it even cuter, you can purchase the Hatch Baby Coverlets which include some fun light covers like confetti, forest animals, or night sky designs for a little bit more money (this unit is about $60, and with the coverlets it's about $75). Downfalls? Well, it uses Bluetooth rather than wifi to connect to your smart phone, which means that the range is relatively limited (about 30 feet indoors); we never ran into an issue, but we have a smaller home. Also, we thought it would be nice to have a lower volume option than is currently available - the volume works well overall, but even at the lowest setting it was a little loud, and the frequency was a tiny bit off for it to be true white noise (but that's being really picky!). Interested? You can check out the Hatch Baby Rest Sound Machine here. 2. LectroFan Kinder Sleep Sound Machine. LectroFan makes one of the best overall white noise machines on the market, the LectroFan High Fidelity White Noise Machine, which is super reliable, versatile, and accurate in its sound emulation. But that white noise machine is not designed for use with children, doesn't have a night light, and cannot connect to a smart phone. 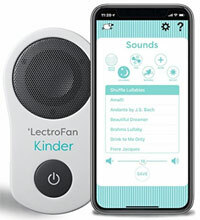 Enter the LectroFan Kinder Sleep, which provides a smaller overall electronic white noise machine that includes a night light and connects to a smart phone app (iPhone or Android). And we love it! It's super simple to use and is all manually controlled through the app. Out of the box, you plug the Kinder unit directly into a standard wall outlet (2-prong or 3-prong outlet), without the need for a cord (of course you could use an extension cord if you wanted to place it somewhere other than in an outlet). Then you install the LectroFan app on your smart phone and pair your phone with the Kinder unit (via Bluetooth). That's how setup for the Hatch Baby unit works as well. Then you're off to the races. In the app, you'll notice that you can separately control sounds and music versus the night light using simple and intuitive sliders for music volume and night light brightness. 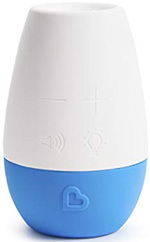 There are tons (like 70 of them) of sounds including white noise, lullabies, fan noise, and more, and there is an adjustable volume that covers the range pretty well. The night light is adjustable brightness and you can set it to white or several colors of the rainbow. The light was nice and soft, and it emanates from the top of the unit onto the wall so it makes a nice soft glow on the wall above. The white noise was excellent and we were really impressed that there was no looping of the white noise, it appears to be all digitally generated on the fly as opposed to simply repeating a track over and over again. You can leave the white noise and/or light on all the time, or you can set a timer on the app to make it turn off automatically after a certain amount of time (maybe 20 minutes or so after it's already done its job to help baby fall asleep). In our testing, we found this system super easy to use, reliable, intuitive, and high quality, and it definitely was useful for helping baby fall asleep and also getting baby to sleep for a bit longer. Instead of leaving it plugged into the wall outlet we ran an extension cord from the outlet behind the dresser in our nursery, and then had it sitting on the back edge of the dresser. Then we didn't need to worry about our toddler getting curious and pushing that giant power button on the front at random times. Or worse yet, pulling the entire thing out of the wall. This LectroFan Kinder is so much more than a bluetooth speaker with preset sounds, and we were really impressed by the app, the naturalness of the fan sound, and the night light. Limitations? Well, it doesn't have battery back-up, and it uses Bluetooth to connect to your smart phone, so its range is limited to somewhere around 30 feet or so. Also, when comparing to the Hatch Baby system, it doesn't let you control it from the unit itself other than turning it on or off, you can only change settings by using the app (unlike the Hatch Baby unit that has buttons on the bottom). So you become pretty reliant on using your phone as a remote control. And there are no easy to use presets or sleep trainer capability, though the app does have the ability to simply recall your last setting. So there are some great features and reliability here, and an overall high quality system that should last you several years. And the price is the same as the Hatch Baby, at about $60. Interested? You can check out the LectroFan Kinder Sleep Sound Machine here. 3. Project Nursery Sound Machine. Project Nursery is known for making high quality, adorable, and reliable baby products that are designed by parents and for parents. 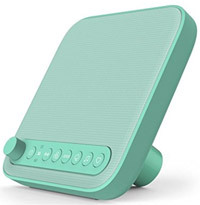 Their top-rated baby monitor appears in our best baby monitor list, and this sound machine is close to the top of this review for functionality, versatility, and a great price. 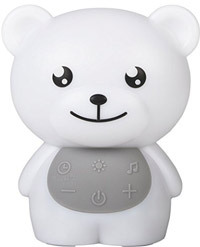 This Project Nursery sound machine is available as an adorable white bear or a cute bear with yellow and grey features. All of the edges and colors are soft and simple, making this really cute without standing out very much in your nursery. It functions as a baby sound machine and a night-light. The sound machine has a total of six sounds, including three natural sounds (white noise, mom's heartbeat, ocean waves) and three lullabies. The sounds are generally good quality and the looping was not readily apparent while listening. The volume was adjustable across a great range, from super quiet to way too loud (at least for most indoor use) at the top end. The sound emitted from a speaker on the bear's back, so we didn't put it too close to the wall - otherwise the sound got a bit muffled. The night-light was cool because it made the entire bear's head glow with light, which was really cute and the toddlers we tested on really loved it. We do want to point out that some babies or toddlers might find it a little scary looking to have a glowing bear or lion head in their room, whereas others won't think twice about it. We liked that the brightness of the night light was adjustable, and that on its dimmest setting it provided a really nice soft glow that wasn't too bright even after your eyes dark-adapted. In our testing, we also appreciated several other features. First, it can be used with a wall plug (provided) or 4 AAA batteries (not provided). So you can use it plugged in while it's in the nursery, then on batteries for portability (in car or stroller) or if there is a power outage. Second, you can have it play sounds continuously, or you can set a timer to automatically turn off after 15, 30, 45, or 60 minutes. Third, we loved that when the timer expired the sound would turn off but the night-light would stay on. This was something we found peculiar about the other systems, since the night light was something we assumed would stay on all night. So that was a nice touch, but might not be perfect for all parents. So there were a lot of positives here, especially for a price point of only about $20, without many limitations to speak of. If we're being picky, the buttons on the front don't light up so it's difficult to know which button you're pressing at night. A bigger issue is that even when it's plugged in, the device seems to default to using the batteries, which means they will drain even when the system is plugged in (so only put batteries in when you actually need to use them). Interested? You can check out the Project Nursery Sound Machine here. 4. Wave Baby Premium Soothing Sound Machine. This is a relatively simple and inexpensive (around $30) sound machine that we have found to be reliable, user friendly, high quality, and at a reasonable price point. Coming in at about half the price of the Hatch Baby or LectroFan Kinder, this device also has about half the features. 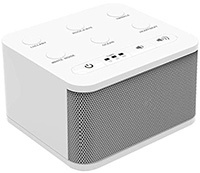 If you're not looking for a night light or a device that connects to your smart phone, this is definitely a great sound machine option for you. Out of the box, we noticed just how simple this system is: it has a power button, volume knob, and six intuitive buttons that correspond to the six sounds it can play. The sounds include white noise, fan, ocean, rain, lullaby, and heartbeat. For a newborn baby, the heartbeat sounds can be very soothing, reminding them of being in mommy's tummy closeby to her heartbeat (and her gurgling tummy!). We actually liked the sounds, they weren't too high-pitched or "tinny" sounding, rather they were soft and soothing. The timer function worked as expected, and it can be set for 15, 30, or 60 minutes. The unit includes a power adapter to plug into the wall, and it has a USB charger port on the back that can be used to power another device or charge a tablet or phone. We actually used it to power our top-rated Nest Cam baby monitor, which worked perfectly and let us avoid having yet another outlet taken up by a plug (but you need to have your own USB charging cable to do this). So there's really a lot to like about this baby monitor, including not just its features and reliability, but also its style that fits nicely into a nursery decor. Downfalls? Well, the sounds do loop about every 10 seconds or so (which you can notice if you listen carefully), and the white noise sound is nowhere near as clean and clear as it is with the Hatch and LectroFan models. But then again, it is about half the price. Interested? 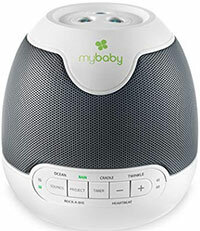 You can check out the Wave Baby Premium Soothing Sound Machine here. 5. 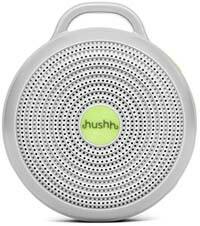 Marpac Hushh White Noise Sound Machine. 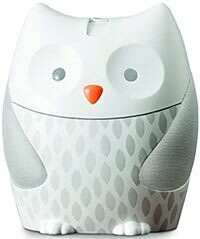 Marpac makes several white noise machines, only some of which are marketed toward babies. The full line-up from least to most expensive includes the Marpac ROHM, Marpac Hushh, Marpac Whish, Marpac DOHM Classic, and Marpac DOHM Connect. The models range in price from about $30 to $70, and they vary considerably in features. As you move up from the Whish to the DOHM, the system uses an actual fan-based white noise, which is the most natural and highest quality white noise technology available on the market. In other words, there is no speaker trying to electronically replicate the sound - instead it uses an actual fan mechanism inside to produce pure white noise. If you're looking for accurate and super consistent (i.e., no looping or subtle background noise) white noise then you should consider the Marpac DOHM Classic or Connect (the Connect can be controlled by a smart phone app and allows you to set sleep schedules). But the DOHM is also heavier, less portable, and could be more of a hazard for curious little fingers (given that there's actually a fan inside). So we are biased towards the Marpac Hushh, which is a baby-friendly version of the Marpac ROHM. The Marpac Hushh sound machine is relatively small, coming in at only about 4" wide and pretty lightweight. It uses a rechargeable lithium ion battery, which makes it much more portable than most other options on this list. When it's being used in the nursery, you can leave it plugged in. Then if you want to bring it on a car trip or stroller ride (it comes with a cute little clip so you can attach to a stroller or car seat), you have the flexibility to unplug it and run it from its internal batteries. This provides much more versatility than most other options on this list, and we were excited to give it a shot. In our testing, we found that the battery life is highly dependent on the volume setting. At high volumes (like when being used outdoors on a stroller) the battery only lasted about 3-5 hours, and at very low volume it tended to last upwards of 15-20 hours. So in most cases we'd imagine you'd use a medium volume setting, which would end up lasting about 10 hours or so on battery alone. This is great for two reasons: first, for portability when you are away from a power source, and second, if you have a brief power outage the unit will keep running. We happen to live in an area where power outages are really rare, but we know that's not always the case. So having the rechargeable battery back-up might be very important for some parents! It doesn't have a huge range of sound options, but it does have the important ones: two white noise settings (bright or deep), or gentle beach surf sounds. We thought the sounds were pretty good for an electronic (versus a fan noise machine) system, and the loop wasn't readily detected. The sound wasn't anywhere near as clean as it is with the Marpac DOHM systems, or even the Hush or LectroFan systems, but it was pretty decent for such a tiny system. It also has a decent night-light and a lock-out feature to make sure curious toddlers can't change settings by pushing the buttons. Limitations? Well, we were surprised that it doesn't come with a wall plug, just the USB adapter cord. So you'll need to use your own phone charger plug, or an extra one you might have lying around. You can get them as cheap as a couple bucks on Amazon or EBay, though we definitely suggest the higher quality and more reliable models (like this one). A second issue is that it doesn't have any timer function, so you can't set it to turn off automatically; when you combine that with the fact that you can't control it remotely through an app, that might not be ideal for you. So definitely some strengths and weaknesses relative to the better-ranked sound machines on our list. A final note is that you'll notice that the Hushh and the ROHM look pretty similar; the difference between the Hushh and the ROHM is that the Hushh is designed for babies, so it has a night-light, lock-out feature, and no lanyard due to the baby safety risk (instead it includes a stroller clip). Interested? You can check out the Marpac Hushh Sound Machine here. We tested the Cloud b Tranquil Turtle, and there were a few features we really liked. First, it's a really adorable baby sound machine, and the Night-time projector system is a neat little addition. The projector casts cool-looking wavy ocean light onto the ceiling of the room, which is a bit different than the classic Cloud b options (the Cloud b Twighlight series) that project twinkly stars. The sound machine plays two sounds - a tranquil melody and ocean waves. But we were disappointed by a few things. First, it isn't actually a white noise machine at all, as it has no sound setting for white noise or anything like it. Second, the light and sound turn off automatically after 23 minutes, and that setting can't be changed to make it shorter or longer. Not sure how they came up with 23 minutes, but that's the deal - I worried a bit that right when our baby started to drift off to sleep, it would shut off. But our babies never fell asleep very quickly at night, so that might not apply to you. Third, it runs on AA batteries only, and while it's nice that they were included in the unit, there is no plug-in option and the batteries run out pretty quickly if you use the system several times a day. So given the price (around $45) we didn't really think it was worth it. You might also want to consider the Cloud b Sleep Sheep, which is a truly adorable option that combines a soft and cuddly stuffed animal with a baby sound machine. This is available not only as a Sleep Sheep but also as a few other stuffed animals, like a fox and an owl. The Sleep Sheep has multiple soothing sounds and lullabies, but it does not actually have white noise. Like the Tranquil Turtle, it has a 23-minute auto-off timer, though it also has a 45 minute option which is a nice addition. We love how you can remove the battery-operated controller from the back and throw the stuffed animal right into the washing machine. The Sleep Sheep is super portable and great for travel, and is also a cute addition to your nursery that you can attach to the side of the crib (using the velcro straps on the back), or have sitting right on the dresser. We've actually owned the Baby Shusher sound machine for several years now, using it with one of our babies. We like it for a few reasons. First, it's a nice compact footprint that doesn't take up much space in the baby nursery, and making it super portable. Speaking of portability, it is battery-operated (2 AA batteries) only, so no option to plug into the wall. Second, it has adjustable volume and a timer that can be set for 15 or 30 minutes. The sound is a loud but gentle shushing rhythm that is thought to be naturally relaxing for a baby. And there is pretty decent scientific evidence that this type of shushing sound works really well to help baby fall asleep and stay asleep for longer. But now that we've tested all of the other units on this list, we have higher standards, and have realized tons of limitations and minor annoyances with the Baby Shusher. First, it's a bit of an awkward design. It's like the size of a tall soda can, and is meant to be set down on its side in the crib next to baby. But as parents we were never really comfortable putting this thing next to our baby, so we always set it aside next to the crib. But it's a little awkward to place because the speaker is on the bottom, so when you stand it up on end, it muffles the sound. Second, you can't plug it in and the batteries tend to only last for about 10 hours of use. So if you use it for naps and night-time, you will end up like us and spend way too much money on batteries. Third, it's a bit expensive (about $35) given its features and capabilities, and it doesn't have a white noise option at all, or a night light. So plenty of limitations here, but maybe worth considering if you're convinced of the power of the rhythmic shushing sound! Skip Hop makes some excellent baby products, including several top-rated diaper bags and baby toys. This Skip Hop sound machine and projector system isn't too shabby itself. Available as an elephant or owl, this is a truly adorable addition to any baby nursery, and you won't be disappointed with how it looks on the dresser or crib-side table. And it has some great features as well. It plays four melodies and four nature sounds, like crickets, ocean waves, and rainforest. It also has a "white noise heartbeat" setting, which is the closest thing it has to actual white noise. These sounds can be played continuously, or a timer can be set to turn it off after 15, 30, or 60 minutes. The volume range is pretty good, though we think the sound quality is overall pretty poor. It's as though many of the sounds are just variations on white noise, nothing sounds very rich or complex, unlike many of our top-rated baby sound machine options. The system also includes a night light with adjustable brightness, which was actually pretty cute, giving the owl a glowing tummy and the elephant a glowing under-belly. The ceiling projector is also a nice touch, though like the MyBaby SoundSpa it's difficult to get the projection beam to go anywhere but straight up above and is thus difficult to get it to actually project above the crib. So there are some decent features in the Skip Hop Soother, but given the higher price (about $40), you can definitely do better for the money. This is a pretty typical white noise and sound machine, but there's nothing that really makes it a "baby" version other than the option for playing a lullaby or heartbeat sound. It is well-made, reliable, can run on the included wall plug or AA batteries, has a 15, 30, or 60 minute auto-off timer (or can be left on continuously), and has a white noise option. But the sound quality isn't great, with pretty poor sound production and speaker quality. Maybe that's to be expected for only about $20? And there's no toddler lock-out to prevent a curious kid from changing the settings. Overall, it felt cheap to the touch, but realistically we had no issues with it in terms of reliability. For about $10-15 more you can get a much better device, so we don't think the Big Red Rooster option is ideal for most parents. This was an interesting option, one that tries to do too many things without doing any of them very well. Out of the box, the SoundSpa confused us - there was no power button! Turns out you need to press the Sounds button to get it to turn on and start cycling through the sound options. It does ocean, rain, heartbeat, and a few others, but no actual white noise (although the ocean sound is such low quality that is basically just sounds like static). All of the sounds were similarly low quality and a bit tinny sounding, and we didn't like how you had to shuffle through each sound option to find the one you wanted. It does have an auto-off timer that does 15, 30, 45, and 60 minute settings, and the volume control was reasonable (though it was hard to find a relatively quiet setting). The interface was clearly not designed by someone who values intuitive user interfaces, but it does get the job done. The projection system was a bit strange because it beams the projection right up onto the ceiling above the system, so unless you're putting the system into the crib itself (which we do not recommend! ), the lights aren't really visible above the crib. But it does have a pretty low price (around $20), so maybe if you're looking to save some money this Homedics Mybaby sound machine could be a good option. These are super cute and portable little sound machines that are relatively affordable (about $30), highly versatile (they can clip onto just about anything), and soft-touch and safe for baby to hold. You can play one of the two built-in white noise options, and use the little volume knob to adjust the volume. Or, you can connect it to your smart phone via Bluetooth and use their VoiceShare app to play about a dozen other sounds. You can also just use it as a Bluetooth speaker and play any other sounds or music you might like. But we were surprised to realize that none of the built-in "white noise" options are actually white noise - one is like ocean waves and the other is like a rain shower. And there's no real "shushing" sound, so not sure why they use that term in the name. So that was a little disappointing. Also disappointing was the app, which was so frustrating (freezing, crashing, losing connection) that I ended up uninstalling it after a few minutes and just using the buttons on the machine. But we did like the portability and simplicity of this sound machine, so it's worth considering for that alone. Munchkin makes a variety of high quality and reliable baby products, including their top-rated diaper pails and LATCH baby bottles, and other baby care products. This is a relatively simple baby sound machine and night light with some decent features. 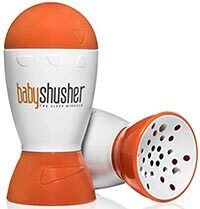 If you're looking for a shusher with the actual "shush" sound, this is a great alternative to the Baby Shusher Miracle Soother, with a better overall design and lower price tag (under about $20). The shushing sound is very similar to that model (but a bit lower quality), but this Munchkin shusher has even more features. It has adjustable volume and night light brightness, an auto-off timer that can be set to 10, 20, or 30 minutes, and a removable lanyard to help you attach it to a stroller or anything else. But the sound quality isn't so great, the volume doesn't go very high (shushing should be relatively loud), the night light is very dim, the buttons are hard to find in the dark (or even in the light, since they are little white icons printed onto a white silicone surface), there is no continuous on option (only timed auto-off), and it only runs on batteries (no wall adapter). So it has pretty good bang for the buck, but we don't think the quality is quite there to deserve a higher spot on our list. Note that Munchkin also makes a Munchkin Nursery Projector and Sound System, that had tons of potential but was generally a pretty poor performer in our tests. Conclusions. A good sound machine for your baby will help your baby fall asleep faster and stay asleep for longer. And we know how important that is for new parents! This is one of the reasons that baby sound machines make a great baby registry gift - if they start using it early, they won't realize how much of a life-saver it is until they forget to turn it on! When we set out to compare sound machines we didn't realize just how many options were available on the market, and how mixed all of the reviews of those systems can be. Some of the cheaper systems we tested literally fell apart after a few weeks or stopped working entirely - we don't include any of those on this list. With safety of your little ones as a top concern, we try to steer you clear of the risky systems (one system actually melted its battery pack and short-circuited!). One of the most common questions we get about baby sound machines is whether to get a portable unit or a system designed to stay in one place. It's the very same question we get when people read a baby monitor buying guide. We suggest the more versatile the systems, the better. If it can be plugged in while in the nursery, and run on batteries when not in the nursery, that's ideal. Same thing for whether to get a combination sound machine that has a night light, nursery projector and sound machine all in one, as opposed to a simpler system. To us, the more features the better, even if you end up ultimately using only one or two of them, they're certainly nice to have when you need them. When we had our first baby, we found that we never used the night light for helping the baby fall asleep, but when we were breast feeding or bottle feeding in the middle of the night, it suddenly became super helpful to be able to turn it on and off as needed. And as parents it's an important part of our job to make sure our babies are getting a good nights sleep, so the less you need to wake them up with bright lights or loud noises, the better for everyone.